The state of the fourth house of a horoscope or question chart indicates ciearly whether or not a Vaastu proves beneficial to one, if it is then when and what degree of happiness will it confer on the owner. I f these charts are prepared in detail in the Krishnamurty Method the predictions can be extensive and more detailed. To understand the importance of a’hy science, one must consider both its positive and negative aspects. It is necessary to understand what advantages accure from a conformity with the science, and what disadvantages follow from going against it. My book affords plenty of information on both these aspects. The future of any Vaastu (including the nation, country, village, colony, factory, bungalow, house) is contained in it. It depends on the types of vibrations emanating from the Vaastu. There may by a difference of opinion as regards how the Guardian of the Vaastu or Vaastu Purush was created, but as regards the power of the Guardian there is no doubt. It is a natural law that the pure power derived from the five elements is transmuted into the Vaastu. It is a speciality of ancient Indian science that it gives the right guidelines in cases where modern science fails to find soluitions. The life-span and the future of the living beings inhabiting a Vaastu depend on the type and potency of the vibrations emanating from it. Why are the culture and religion of a country, town or house different from those of others ? Why does a country (like USSR) disintegrate, while another country (like Singapore) prospers and another country is forced to face constant strife and natural calamities ? The solutions to all these insoluble mysteries can be found in the Vaastus. What applies to the country applies to the town, house and office. The features of any envent are mostely derermined by the Vaastu. Many times we find that an alteration in the Vaastu leads to outstanding incidents in a short time, be they progressive or destructive in nature. The root cause of birth, death, marriage, happiness and sorrow may be in the Vaastu. The holocaust of the terrible atomic bombs which were dropped on Hiroshima and Nagasaki during the World War 11, Soviet Russia’s disintegration, the dance of death owing to epidemics, famine and natural disasters in Africa, India’s periodic exigency to ask for loans form other countries, the undercurrent of political unrest and extremism which is boiling Pakistan, Saddam Hussain’s invasion of Kuwait, also comprises the six types of feeling : lust, rage, infatuation, arrogance, envy and avarice. Because of the various metals and chemicals in the earth, such as gold, iron, petrol, oil and coal, different qualities come into existence. Ancient history reveals how for aeons the old is being destroyed and the new created. And man appears for ever endeavouring to be on the path of progress. Vaastushastra - History, Epics, Many sages and saints and holy people have studied Vaastushastra deeply and have written many books on it. Well studied referances to Vaastushastra are found in the epics of Mastyaprana, Garudapurana, Agnipurana, and Vaayupurana. Likewise well reasoned thoughts are found in the Ramayana and Mahabharata, and works of Bhavabhooti, Kalidasa and other great poets. The city of Ayodhya was build by Manu, a practitioner of Vaastushastra. There the designs of houses, temples, tanks, gardens, community halls are all according to Vaastushastra. Even in the Roman empire different buildings were constructed following the dicatates of Vaastushastra. And the wonder is that there is so much similarity in the eastern and western concepts. Two pioneers hold the pride of place in Vaastushastri-They are Vishwakarma and Maya. Some people call Vaastushastra Maya Vaastu. Its study and practice appear to be more widespread in South India. Many people have heard of the Maya Sabha in MahabharaGi and the epic took plance. The Kouravas and the Pandavas were consins and were extremenly strong, extremenly valiant and enormously brilliant personages. In order to destroy injustice and uphold truth, Lord Krishna conceived of an amazing strategy. After considerable study and secret confabulations with Maya, he had a hall constructed which was replete with all flaws but enchanting. This was the Maya Sabha. Krishna was an expert in Vaastushastra also just as he was a master of all the other science. He knew very well that if in the centre of any building a pool is constructed, the building will be destroyed along with all the inhabitants therein. When the valiant Duryodhana was invited to see this new hall, he mistook the central pool for land and fell into it. This amused Droupadi and she laughed. From here the story begins. One should deliberately avoid raiding a Vaastu, or taking advantage of the owner by cheating or grabbing a Vaastu by exploiting his helplessness. Though financially it may appear very attactive at that time, in the long run it is sure to recoil on one. Such Vaastu should be sold off as soon as possible. Vaastu Chart to Denote Life’s Direction - A matter for Study The state of the fourth house of a horoscope or question chart indicates ciearly whether or not a Vaastu proves beneficial to one, if it is then when and what degree of happiness will it confer on the owner. I f these charts are prepared in detail in the Krishnamurty Method the predictions can be extensive and more detailed. I f we consider the house with which the planetary lord of the fourth house is closely associated, then the matter connected with the Vaastu becomes more and more clear. The planet will be connected with the 8th and loss house, and with the 8th house. For example, if the lord of the fourth house is in the melefic house or the lord of the malefic house is in the fourth house, then to get happiness from the Vaastu will cost a good deal of effort. Or when the dasha of the malefic hose is on, or the gochar planet is transiting backwards, numerous difficulties will have to be endured. One feels lost and no ray of hope is in sight. Darkness envelops everything. One no longer feels like living, and faint desires of suicide come to be felt Vaastu Questions chart There are many different methods of predicting the future according to question charts. It looks as if these methods are practised more in India than elsewhere in the world. Some methods are based on the moon and some on nakshatras. Other systems take into account the sun and moon or omens. Of all these the question chart is the most reliable. There are different ways of casting the questions chart. Some consult the almanac, take into account general conjuctions and cast the chart. In such cases when there is just one conjuction, or to be more precise, only a single ninth fraction if two persons come one after the other and ask similar questions, the answers will be the same. But in fact the answers may be different. A young lady and her lover asked their family astrologer separately about their love affair. He told the girl that she would fail in his quest. The reason was that the conjunction and the moon had changed. The funny thing was that the young lovers married each other. Some astrologers ask the inquirer to choose a number from one to twelve, or ask for any number and divide it by 12, and determine the conjunction and try to find out which is more powerful, the chart of the conjunction or the moon or the sun, and apply it to the question chart too. Obviously they earn a lot of money which indicates that their chart is very powefull. Some people get into a quandary about which chart to use : the chart of the time or the question, or the time of predicting or the time of the happening. (For example, if a girl has run away, the time of the flight.) 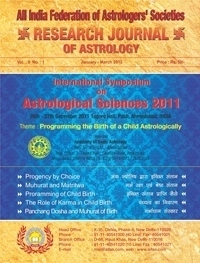 In this matter too there is a lot of confusion among astrologers. After years of study and pondering, I have come to the final conclusion that neither the time of occurrence, nor the time of the question is important. What is important is the chart of the time of judgement. The late Mr. Krishnamurthy has done considerable reserch in this area. For several years I am experiencing astonishing proof of his method. I have a set of folded slips of paper each with a number from 1 to 249 written on it. With these it is possible to answer questions correctly. Answers to several questions as, regarding Vaastus have been fiundout absolutely .correct. We can answer such questions related to life problems. It is possible to check the accuracy of the chart and the mind of the inquirer. For, some people may wish only to test the efficacy of astrology. The Krishnamurthy and consideration of the 11th house and all malefic planets..But the answer is difinitely right.